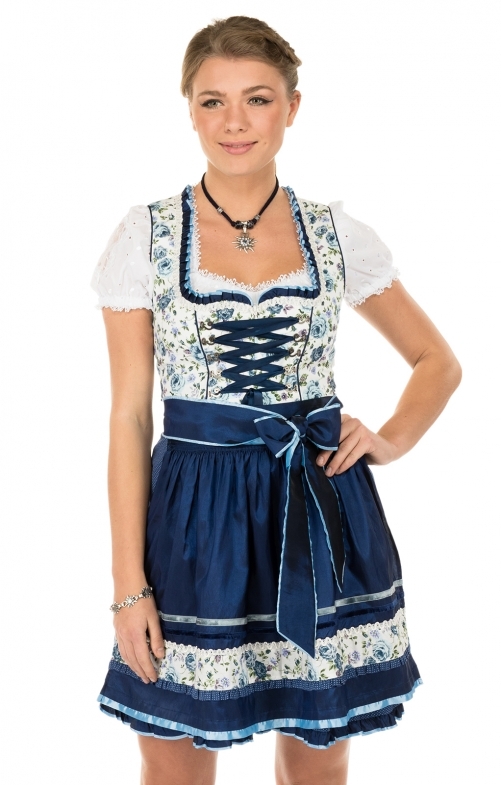 For the prettiest flower in the meadow (and at the Bierfest): this short mini-dirndl features a skirt length of 50 cm by KrügerMädl and impresses with its charming details and its timeless colouring. The distressed silver bodice clasp and contrasting, braided ribbons add a touch of class to the finely detailed bodice with its floral print, sweetheart neckline and concealed zip fastening. French darts around the bust and a supportive corsage create a feminine cut that flatters the figure. The delicate polka dot pattern of the skirt contrasts with the glossy apron for a sophisticated look that beautifully emphasises the waistline with a wide, smocked waistband. Fine velvet ribbons and a rose border consciously reflect the design of the bodice to perfect the look of the mini-dirndl.